The words "Best Of issue" have been know to strike fear into the hearts of Bohemian writers and editors. This is my first Best Of issue as editor, and I have to say I've rather enjoyed it. It's our biggest issue of the year and a beast to put together, but it's also a lot of fun because we get a revealing look at what you, our readers, think are the best people, places and businesses in the North Bay. And we get to write about our favorite North Bay personalities and experiences in our "writer's picks." 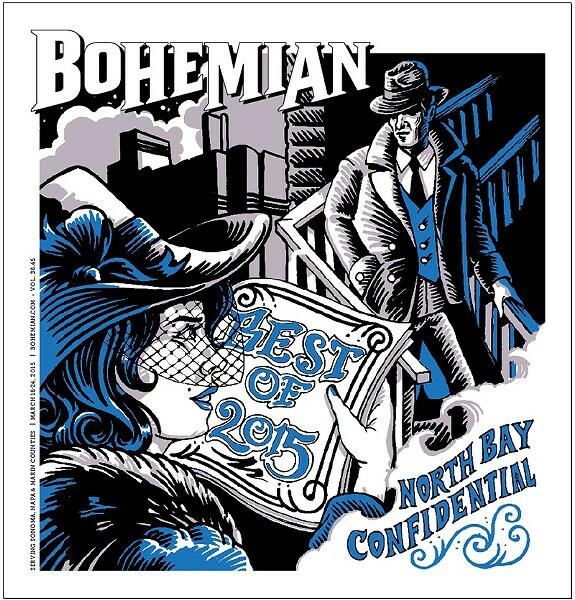 We also had fun with the theme of this year's issue: North Bay Confidential. The conceit is that it takes some sleuthing and insider knowledge to discover what makes the North Bay special. So in the spirit of Raymond Chandler and Dashiell Hammett, we invented a hardboiled detective named Jake McGuinness and set him loose in the North Bay to find a wayward dame. News editor Tom Gogola, calendar editor Charlie Swanson, regular contributor James Knight and I each took turns writing the "chapters" that introduce our six sections: Recreation, Food and Drink, Culture, Everyday, Romance and Family. Each of us had to pick up where the previous writer left off and move the story forward. We also enlisted artist Joe Leonard to ink our noirish cover and the illustrations inside the paper to set the scene. I think he did a brilliant job. If you won an award, click here to get yours. Did our detective find the girl? Read on to find out. Reynolds Pemberton's office was on the 14th floor of a slate-gray tower of steel and glass at Battery and Sacramento. Pemberton was CEO of a financial services firm. Jake McGuinness' net worth meant he didn't need Pemberton's services. But the CEO needed his. "Good morning," Jake said to the receptionist. "I'm here to see Mr. Pemberton. The name's McGuinness." The receptionist, an angular blonde with her hair pulled back so tight it looked like it would snap, appraised Jake with a faint sniff. "Do you have an appointment?" "I sure do, doll. Ten a.m. Do you have a name?" She didn't respond, but glanced at her computer monitor to confirm Jake's appointment. "Please have a seat, Mr. McGuinness." "Don't mind if I do," said Jake, pulling out a smoke and a scuffed Zippo. "This is a no-smoking office," the receptionist said, looking at him as if he'd pulled out a gun. "Easy, toots. I'll hold my fire." After a half hour a heavy oak door opened behind the nameless receptionist. A tall man of 60 or so with a dark pin-stripped suit strode toward the receptionist and said something to her, then looked up at Jake. "I'm Reynolds Pemberton. You the detective?" "I am, but I usually go by McGuinness. Jake McGuinness." Pemberton's face flushed, and he looked like he was going to say something else but thought better of it. "Come into my office, please." With a wink at the receptionist, Jake followed Pemberton. What an office it was. Floor-to-ceiling windows offered views of the Bay Bridge and Golden Gate. Pemberton settled into his black Eames chair like a man climbing into a plush sedan. "Drink?" he offered, pointing to a row of bourbon and gin bottles on a small table. "I'll get right to it, McGuinness. My daughter, Molly, is gone and I want her found. And I want you to be discreet. Can you do that?" In spite of all the trappings of wealth and power, Pemberton looked vulnerable with his back against the plate-glass window high above the thrum of the city. "I can be discreet, Mr. Pemberton. As for finding your daughter, that I can't guarantee. But I'll do my best. Fill me in. Where did you last see her?" Pemberton paused and then rotated his chair to face the orange bridge and fog-shrouded Marin Headlands beyond. "Last I heard, she was there," he said, pointing with his chin. "In Bolinas." He spoke the name of the town like it was coated with dirt. . . .